Today’s blog post is from Sarah Spikesley, a teacher at Hinchingbrooke school. As teaching professionals, it can sometimes seem as though the only time students use the language of argument is upon the imminent and ‘unjust’ confiscation of a phone or rogue fidget spinner. The misconception that debating is an archaic skill reserved only for the fee-paying elite or prospective politicians is a safe and predictable one in which to retreat. It is all too easy to dismiss enrichment in more traditional skills such as Oracy in favour of a more prescriptive short-termist approach to teaching; a rather bland recipe concocted in the exams pressure cooker. As an English teacher, I can wax lyrical about the enchantments of Shakespeare, McEwan and Plath, and the far-reaching impact of landmark speeches from history’s oral stalwarts. But whilst it is an educator’s dream for students to become well-versed in the works of Mandela, Luther King Jnr and Churchill, it is also in the quieter recesses of your classroom that you will find the kind of magic that lasts. They are the conversations you have to strain your ears a little more to hear; the perfect alchemy of watching reluctant students finally stand, indulge in a nervous pause and carefully select the words to captivate a sea of intimidating faces. 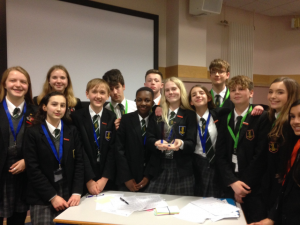 The story of debating and Oracy at my school, one of the largest comprehensive schools in the region, is a recent one, and, as with any large comprehensive school, embedding any new initiative has not been without its challenges. Having taught some Oracy lessons to a range of Year 9 classes, we established our first ever Debating society just three years ago. Every year we start from scratch introducing a new group of Year 9 students to debating, with the most important and difficult skill being the ability to listen. We are fortunate enough to have a healthy uptake each year coached by peers from previous years. Now Chairs, Clerks and Senior debaters, our ‘veteran’ orators serve more of an ambassadorial role, peers who model and run debates, speeches and extra- curricular events. They are without a doubt the most powerful weapon in our Oracy arsenal. After all, embedding new projects is not simply dependent on its leadership but also its sustainability. Now, as a Head of Department, I can continue to run the society as effectively as I did as an RQT with the students firmly at the core. And that is exactly as it should be. Once students had ‘caught the debating bug’ the next question was how to harness and expand this enthusiasm to include more students and maximise impact (quite a feat when your school is our size!) So, we decided to launch a whole school Literacy project because when we interviewed students about how they would like to be supported with their Literacy, they requested to be partnered with a peer; someone who had overcome the same obstacles they faced and understood the challenges of all parts of Literacy from writing to speaking. In this endeavour, our orators were key and exponentially improved the confidence of students struggling with Literacy. At our peak, we had over 300 students involved in the programme with students in Year 10 and 11 coaching students in Year 7, 8 and 9. 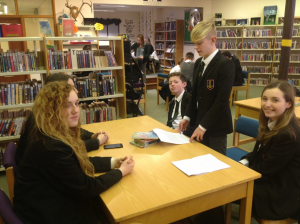 We also appointed Sixth Form team leaders who were integral to overseeing the event in our library during pastoral time when we were hosting up to 100 students per session. Since then, we have entered teams into the ‘Up for Debate’ competitions and students have enjoyed their experience so much that they keep coming back to coach the next cohort. So ladies and gentlemen, if I have told you anything today let it be this; that embedding a culture of Oracy in your school will undoubtedly require an initial investment of time and energy, but it will also be the discipline that will remind you why you trained to become a teacher in the first place. I am not ashamed to admit that I’ve cried alongside parents and co -workers when after an event our students have not only experienced success but more importantly learnt how to become great competitors. A lesson spent interacting with your students and getting involved in the debate yourself is worth its weight in gold. Oracy is a skill that has the potential to change the lives of all young people irrespective of ability, gender, age or religion. Isn’t that a sentiment that we need to champion in schools, now more than ever? 1. Baby steps: Start small! Embed short 1 minute speaking activities into your lessons to build confidence and do this frequently. Embedding a culture begins with changing small things and doing them routinely. 2. Teach Oracy as a listening skill with clear expectations when each student speaks: A key misconception is that your loudest students will be the most effective orators. Debating is not a high level skill because of the speaking aspect but rather because students are required to listen. The unexpected side effect of teaching Oracy is that students become more well-rounded, considered independent learners and cope with their other curricular demands far better as a result. 3. Don’t shy away from contentious topics: Students are rarely tempted into debating with an orthodox or overcooked motion so upgrade your usual ‘This House Would ban school uniform’ style debates! Don’t be afraid to include a more comedic motion or something more topical; that way your students will see purpose behind your lesson. 4. Great debating is synonymous with great writing: Once your students can speak uninterrupted to for a whole minute, introduce scaffolds with BAPOB words (because, and, perhaps, or and but) that they must refer to in order to extend the response. This will help extend analytical or argumentative writing and encourage students to see the link between speaking and writing. 5. Actively develop the resilience of your students: Students need to know it’s ok not to get it right first time and that navigating points of clash and disagreements is an integral part of a democratic society. There will be times when they will stumble through an idea, lose their notes and fumble for a word. Grant them the gift of struggling; we all learn more from setbacks than success. 6. Change the feng shui of your classroom: Just as you may have different seating plans for different abilities, allocate a differentiated partner for Oracy too. A change of scenery can change the climate of a classroom and improve pace and variety. Pair reluctant speakers with your more confident orators. 7. Remember a noisy classroom is not necessarily a poorly behaved one! As long as you are clear about expectations and timing before you set off, noise is a comforting sound to reluctant speakers at first. It gives them a comfortable cacophony to conceal themselves in until they are more confident. Poor behaviour is not caused by the presence of noise, rather the absence of structure, role assignment and planning. Invest in a gavel, buzzer and/ or visual cue so that you retain control of the room. 8. Use older confident students wherever possible to model: Peer power is always effective in changing cultures and changing perceptions. Our ambassadors have been vital to our success. 9. Rope in your colleagues to spar! Students are afraid to challenge views because curriculums often only require students to know the ‘right way’ of approaching an idea or ‘the right’ theory or formula. Deliberately model a discussion between yourself and a colleague, this will show students how to both win and lose with grace. 10. Create CPD opportunities for staff: Whilst debating definitely began as an extra-curricular venture for us, regular CPD events enabled us to promote this skill in classrooms and challenge the views of sceptical members of staff. For Oracy to improve school wide, all teachers need to be responsible for raising the quality of discussion in lessons.